Even though I love Illustrator, I use the other Adobe products frequently. I use Photoshop all the time with elements I have created in Illustrator. Having the correct color and swatches is essential and I always found it frustrating getting all the correct colors into other CS3 programs. Finally I learned a fast and consistent way to exchange swatches from Illustrator to the other CS3 programs. I am using this feature in the Adobe CS3 programs. 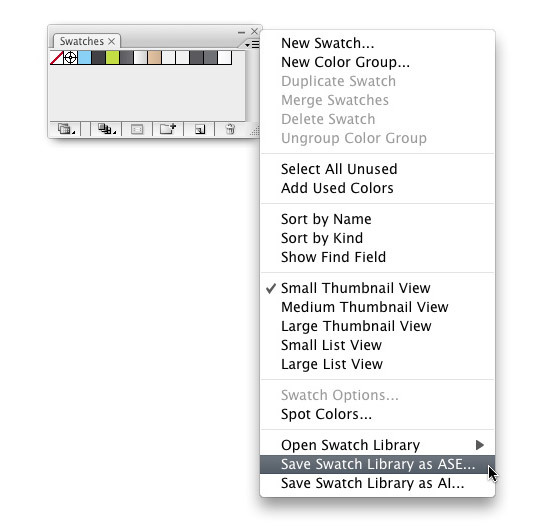 In CS2 the feature is labeled as Save For Exchange instead of Save Swatch Library as ASE under the pop-up menu in the Swatch panel. Gradients, Patterns and Tints swatches are not exchangeable. First, set up the Swatch palette with the swatches you want to exchange and trash any swatches you don’t want. Next, choose Save Swatch Library as ASE in the pop-up menu of your Swatch palette, and save the swatches somewhere you won’t forget. Now your will be able to load the swatches into other CS3 applications. 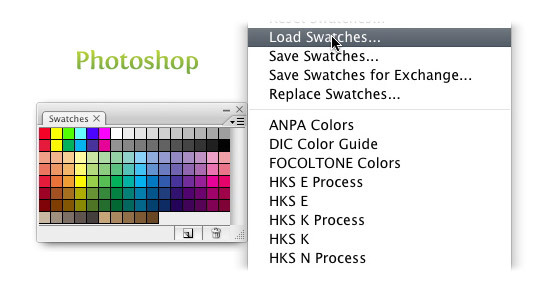 In the Swatch palette of any other CS3 program, bring up the pop-up menu, select Load Swatches and find your saved set! You can save swatches from other CS3 programs and import them into Illustrator, just like you did with the Illustrator swatches. This feature is pretty handy and it can save you a great deal of time! Yea! I love swatches. Thanks for such an amazing tip! Legal essa dica cara, teu site é muito bom mesmo, continue assim. ps. : sorry for the portuguese, but i’m brazilian and not speaking english very well. Awesome tip! Who would have known! you are a fricken genius.